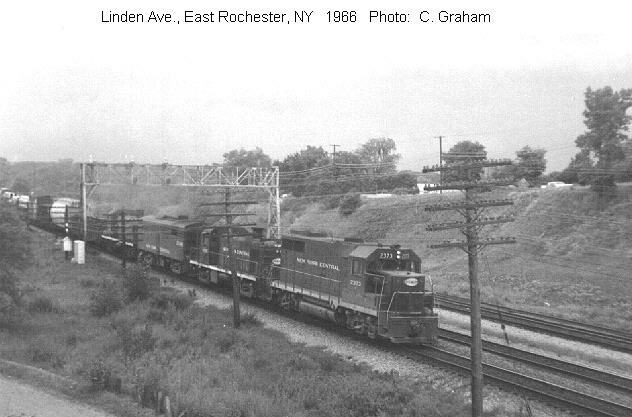 This page features pictures of the New York Central and the Baltimore and Ohio on the eve of the Penn Central merger in the Rochester, New York area. I suppose all of us have a spot that holds a special place in our hearts where we first started hanging out at track side . For me, it is Charlotte, on the Genesee River north of Rochester. Freights would come down the river from Rochester and switch cars in a small yard there. 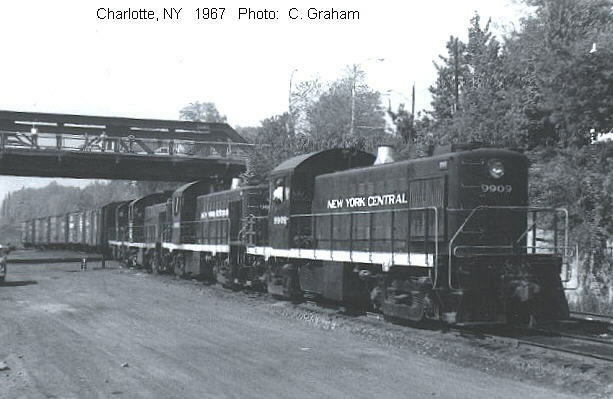 The Alco RS-1's in this picture, taken in September 1967, are just arriving in Charlotte from Rochester. The lead unit (already renumbered in preparation for the Penn Central merger) once was NYC 8109 in which I was fortunate to experience a first diesel cab ride as a kid of 15 or 16. The Charlotte Branch ends with a scissors wye onto the Hojack Line which ran along Lake Ontario. I'd placed my camera on one rail of this wye to catch the tail end of a train moving east on the Hojack and crossing the swing bridge over the Genesee River. Chuck (back to camera) looks on as the transfer caboose passes a recent mishap. 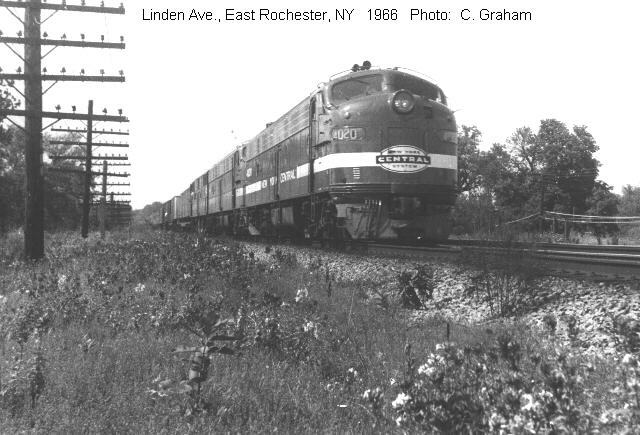 Taken in September 1966 on the NYC main near Linen Avenue east of Rochester, this freight is typical of the mis-matched power the Central used on most freights in the mid-60's. I find it intriguing and carry this practice over to my modeling activities (much to the chagrin of some of my friends). This eastbound is headed up by a GP-35, a couple RS-2's and an FB. The B&O had a branch running north from Rochester to service a coal barge loader on the Genesee River. A pair of B&O SW-1200's ease a cut of loaded coal hoppers onto the coal loader trestle pictured below. On the right, yours truly watches the action. Once on the trestle, the loaded coal cars moved by gravity with a brakeman riding each car to stop it over a hopper. In the building on the right shakers knocked the last of the coal out of the hoppers before the cars continued on out a switchback (out of sight to the right) and returned on the track at the bottom of this picture. After loading, the barges would be towed to steel mills or power plants on the Great Lakes. I was saddened to visit one of my favorite haunts in August 1966 and find them tearing down the platform sheds. Kodak Tower looks down on the destruction. 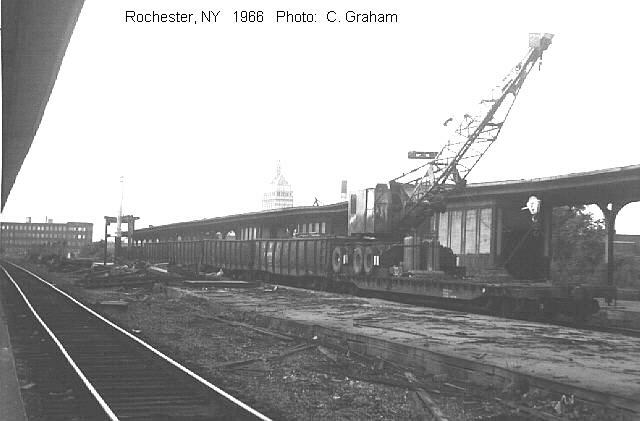 In a few years the entire Rochester station would be razed. Now, 30-some years later, I find the details of the rubber tired crane on a flat car of interest for modeling. Power Parade Chuck kept hanging out at the Goodman Street Yards of the New York Central in Rochester and would send me copies of the pictures he took there. Of particular interest are the pictures of diesels used on the Water Level Route in the years immediately before the Penn Central Merger.